I've never tried Roxana Villa. This one sounds appealing. Thanks for the draw! Fern and tidepool?! Sounds amazing. Please enter me! - Katherine B. Yes, I'd like to be entered. I'm new to her work. Sold! Unless, of course, I win, which would be great. I've been lurking around here for ages, but Donna, your review has finally flushed me out. I'm not in the US so sadly, I can't enter the draw. But never mind, because I'll purchase a sample along with my favourite of Roxana's fragrances: wonderful, mysterious 'Q'. There are a handful of perfumes which affect me deeply, in a way that I'm unable to explain - and Q is one of them. It also does something quite remarkable for me: it calms me when I'm stressed...it comforts me when I'm blue and in need comforting... and when I'm happy, it takes my spirits even higher. Extraordinary! I've never tried any of her fragrances, but would love to start with GreenWitch! It sounds wonderful! Thanks for the chance to try it! Well, please enter me in this drawing. I don't have a favorite Roxana Villa fragrance, but I would like to try anything that smells like this sounds. I am totally itching to try GreenWitch. Great draw!! I have a friend who's managed to get my very, very curious about Africa stone, and the idea of a "sea chypre" fascinates me - I'd love to be entered in the draw. Sounds very intriguing. Please enter me in the draw. Thanks! I have never tried Roxana, but would love to... please enter me in the draw! I haven't yet tried any of Roxana's scents, but I'd love to. Although "Africa stone" made me laugh -- what a hilarious euphemism for fossilized poop! I'd love to be in the draw for this! I've tried and really enjoyed her Lyra and have been looking forward to trying more. Thanks! Sounds deep and absolutely marvelous! Sign me up! I would love to try Greenwitch. I haven't been lucky enough to try any other of Roxana's fragrances. Please enter me in the draw. Mmmmm~the smell of the ocean and some witchiness, too! I haven't tried Roxana Villa, but I know several fans. Would love this one, I am sure. Thanks for the draw!! The older I get, the more I appreciate chypre fragrances. Sounds lovely! Please enter me in the draw. I would love to try this. It sounds wonderful especially if it has a vintage appeal. 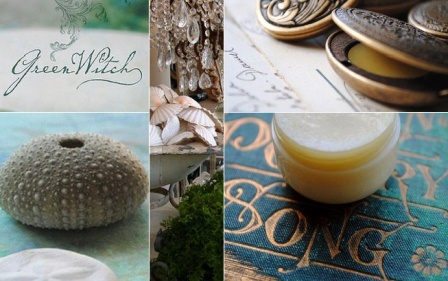 I would love to try GreenWitch in the Solid perfume. I haven't yet tried any of Roxanna's fragrances, but have been wanting to for some time... and I would love to smell a genuine green-chypre! Thanks for the review and the draw! Please enter me in your drawing. It sounds pretty amazing. No need to enter me in the draw- just wanted to say that I love that scent, think Roxana is brilliant and you're words really captured how lovely the scent is. Just stopped by to say I'm glad for all the curiousity and love being shown to Roxana and Greenwitch. It's truly a remarkable work! Great review, Donna. I've never tried Roxana Villa, but have been tempted by GreenWitch. Please enter me, thanks. No need to enter me--just wanted to shout back a "Yes!" for GreenWitch. I love the way Roxana has truly brought together a classical expansiveness and complexity with a modern, very California kind of feel. I've encountered very few "natural" perfumes that have that kind of structure and sense of space in them. Must be hard to do! This brings me back to college days during a madrigal group tour during which we stayed over in Folkestone, England, with its rugged coastline, and the scents and sounds there. I'd love to try it. Love your take on this one Donna and I love the genre Sea Chypre. I used it in my review and I didn't realize that you had created it. It's a perfect description! I have not tried any Roxana fragrances, but this sounds so interesting. Thanks for the drawing! I have not tried any of her fragrances yet but her website and store are beautiful. GreenWitch sounds fascinating. Please enter me in the draw. love the name and the concept... would love to try this. What a gorgeous review of GreenWItch Donna! You really captured its essence. No need to enter me in the drawing, I just wanted to let you know how much I enjoyed your review. Very curious about hyrax generally. Please put me in the draw, thank you! Marine chypre, how true that is! Beautiful evocative language that leads me to appreciate Roxana's perfumes all the more. I'm sorry to say that I haven't heard of the line. Nevertheless, please enter me in the draw. This scent sounds so interesting. Gee, what a luscious life she has--keeping bees and making perfume. Sounds wonderful!! Donna, you are such a treasure. Bountious gratitude for your keen appreciation of scent and the way you write about it. We are all so very fortunate! I thought the sea chypre already existed...isn't that Odalisque, or rather, its former incarnation? I'm a chypre vypre, so please enter me in the draw. I'd love to see more pressure exerted on the industry by US to bring oakmoss back into compliance with Euro regs. The mushroom chypre you suggested a few weeks back, Indolice, is a real stunner! A lovely review, and I'd love to try Green Witch! Roxana's scents are amazing! Thanks! I've been wanting to try this ever since I first read about it. If it's not too late, please enter me in the drawing. Thank you for sharing! Oh, this sounds absolutely lovely. I'm very intrigued by the world of natural perfumery, and hope I'll get a chance to start with GreenWitch! I've been wanting to try this for a while. Thanks for the giveaway! Mango, I agree about Q, that one is magical too, thank you for commenting! Beth, I don't know if I was the first person to use the term "sea chypre" or not, but I hope we will see more of them created by perfumers, if GreenWitch is any indication of what the possibilities are! Roxana, thank you,it is truly a privilege to smell this beautiful creation. JMBalaya, I have only smelled PDN's Odalisque once, I must try it again to see if I can smell any sea notes; it is a lovely fragrance, but then, I do have a special weakness for green chypres anyway! Perhaps it's just me...but to my nose Molyneux's 'Quartz' (pre-EU) has a sea note. I've even worn it to the beach, juch to see what happened. For me it's definitely there. I wonder if anyone else gets this? Sounds wonderful. Wore Quartz on 1980, wish I could remember it more clearly. oh, it sounds lovely! Haven't tried any of hers before. Would love to be entered. Thank you. Well, I do have a US shipping address though I am not there at the moment? Can I win? If that's allowed, I'd love to be entered, because I've been wanting to try Roxana Villa for a while now! If it's not too late, please enter me! I've never tried any of Roxana Villa's frags and this one sounds very intriguing. THE PRIZE DRAW IS NOW CLOSED. Thanks for stopping by, everyone, and the winner will be announced shortly. Good luck!